40" x 42" x 36"
steel, 92" x 38" x 27-1/2"
This is the first in a series on American sculptors. The following brief biography of Chamberlain is from The Britannica Encyclopedia of American Art (Chanticleer Press, Inc., New York: 1973). 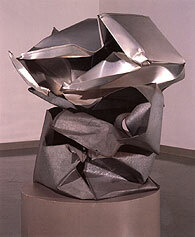 A sculptor of the generation of younger artists affected by the liberating notions of the abstract expressionists. 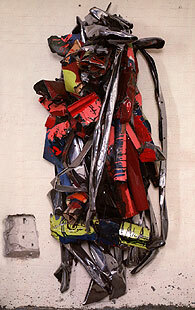 His best-known works are the baroque, abstract sculptures he created from the discarded chassis of automobiles, in which he assembled the parts freely and used the original colors in his compositions. "Privet," 1997, 13' x 60' x 23"
Born in Rochester, Ind., Chamberlain studied sculpture at the Museum School of the Chicago Art Institute for two years and then attended Black Mountain College, North Carolina (1955-56), where he was exposed to the vanguard theories of both artists and poets. When he moved to New York in 1958, he began developing his method of assemblage, using small found parts first in small models and later in larger versions of bend and twisted steel. At first he seemed to have been impressed by the compilation methods of David Smith, who also relied a great deal on found parts, but Chamberlain later showed a preference for larger masses. His work stressed the deep volumes and eccentric folds he managed to get when he squeezed and compressed old body parts from automobiles. In the late 1960s, he turned for a while to painting, using an enamel automobile finish, and to plastic sculpture, using mineral-coated plexiglass. Chamberlain has exhibited widely, including one-man shows in New York, Chicago, Boston, Los Angeles, and London, and has been included in important international exhibitions. 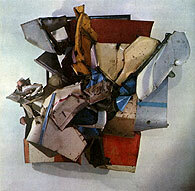 In 1971, he was given a retrospective exhibition at the Guggenheim Museum in New York City. Editor's Note: A second retrospective of Chamberlain's work was exhibited at the Museum of Contemporary Art, Los Angeles, in 1986. A more complete essay on Chamberlain's life and work to the present day is posted online at www.diacenter.org/exhibs_b/chamberlain/essay.html.